Beer and Food Pairing in a Tap! TapThat is a mobile application that allows you to rate beer and food pairings as well as find new beer and food pairings to try. TapThat is currently in a closed beta test. If you’d like to participate in the test please request an invitation using the button below. Help us bring TapThat to your device sooner. Find pairings to go with a particular beer or food. You can search by a beer name to find a listing of foods to pair with it ordered by highest rated. If you already know the food you’re eating and looking for a nice beer to drink with it, you can also search by food and receive a list of beers to try with it sorted by the highest rated. If you’re just looking for some new ideas you can browse through our list of beers or our list of foods. The browse beer menu allows you to filter by brewery or type of beer in addtion to the name. Once you select either a food or beer item from the browse menu you will see the ideal pairings sorted by the highest rated. Want to see what the most popular pairings are on TapThat? Visit the top menu to be able to view the current favorites. You will be able to sort the top menu by overall top pairings, your top pairings, as well as your friends top pairings. The top pairings menu is a great way to find some new beer and food pairings to try out. You can add any beer and food pairing you try! Was it great? Was it terrible? Share your findings with the TapThat community so everyone can benefit. 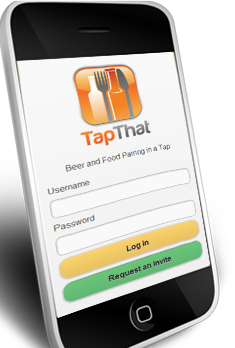 TapThat add menu is specifically designed for anyone to add ratings whether they are beer experts or beginners. We ask you 3 simple questions then calculate the rating for you.